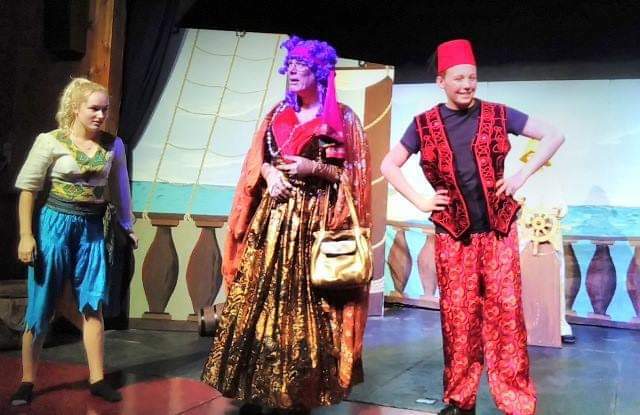 Sinbad the Sailor sailed into Rye Community Centre on Friday January 25 when Rye Players presented the joyous first night of their traditional panto. The Mayor, Cllr Michael Boyd, and Freeman of Rye, Priscilla Ryan were honoured guests. The evening was a delight, with youngsters Poppy Baldock, Hector Nelson-Smith and Amelia Jenner giving confident performances as Sinbad, his brother, Sillibillibad and love interest, Princess Haidee. Stef Charles’s villainous tour de force as Cassim had children and adults alike baying for his blood whilst fellow Camber resident Mike Botten brought a delicate, wistful beauty to an understated Dame, Mrs Sinbad (oh no he didn’t!). Captain Pugwash (Sally Pattinson) appeared by kind permission of Mrs Ryan and proved the enduring popularity of this lovable seadog. Rye panto stalwarts David Bentley (the Old Man of the Sea), Helen Gray (Queen of the Diamond Realm), Steve Blattman (the Caliph) and Sandi Bain (Tom the cabin boy) ably kept the narrative hurtling along whilst an excellent chorus sang and danced in well-drilled routines that enchanted the capacity audience. Special mention must be given to Sarah Nelson’s comic turn as Micky the Monkey, Judy Wall’s spectacular sets, the fabulous costumes from Dilys Mayor and some nifty direction by Helen Gray. The town turned out to support a vibrant show that banished January blues completely. Roll on their next production, a spoof Macbeth. Auditions February 5, at 7pm, The Queen’s Head.